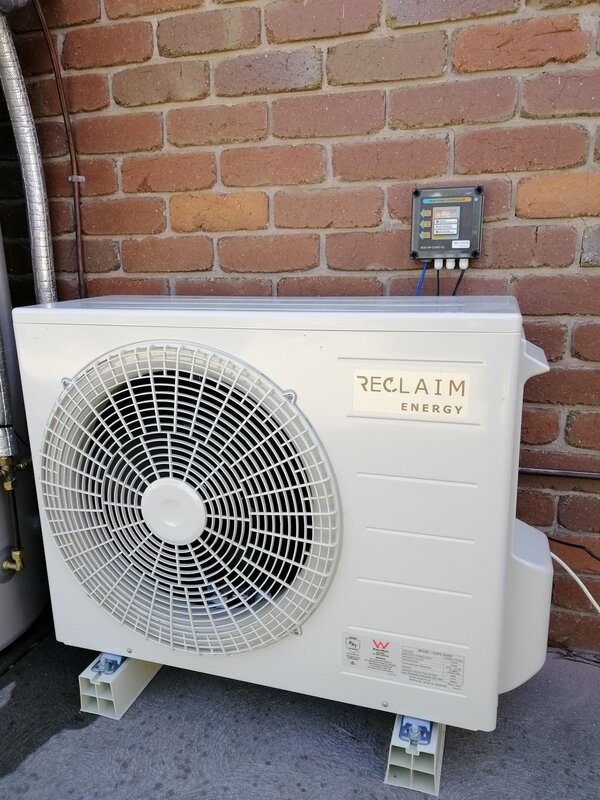 Red Circle Solar is proud to be a dealer of Reclaim Energy Heat Pumps in Australia. Reclaim Energy CO2 heat pumps now available! The Reclaim heat pump offers the highest efficiency (COP of 5.6). Whisper quiet and industry leading 6 Year compressor warranty! A heat pump uses the energy in the ambient air (Air heated by the sun) and transfers that heat to water using a heat exchanger. Let’s say the air temp is 15 deg C. So how does 15 Deg air heat water to a temperature that can be used in the house? Pressure! And lots of it. The heat pump has a fan that blows the air past a radiator (like the one in your car) and the radiator transfers the heat in the air to a refrigerant gas. The gas is now 15 Deg. The gas is then pumped through a compressor and pressurised. As the gas is pressurised, the temperature in the pressurised gas increases. The gas is pressurised to a point where the temperature of the gas is 65 Deg C! The 65 Deg C heat is then transferred to water using a heat exchange. The hot water is then transferred to the hot water storage tank for later use. Using a refrigerant gas and a compressor it is possible to multiply the energy input by a factor a 5. I.e., an efficient heat pump can produce 5 times more energy (in the form of heat) than the energy used (electricity) to run the machine. Sounds like magic? NOPE. Just a smart way to use electricity if what you need is heat or hot water. Your fridge uses this same principle but in reverse. It takes heat from the food and expels it out of the fridge through the radiator in the back. Food/ external heat source heats the fridge, heat is transferred to a gas, gas is pressurised and therefore increasing the temperature differential compared to the ambient air, heat is transferred to the ambient air. Everything is trying to be the same temperature all the time. Heat will transfer freely. A solar heat pump is an incredibly energy efficient way of heating your water. If you install one, you’ll notice a reduction in your energy bills, and you’ll also be playing an important role in ensuring that our environment is safer and healthier. If you decide to invest in a solar hot water pump, you’ll want to ensure that you’re working with the very best in the business. This will mean you get the very best equipment and materials possible, as well as the best service at the best price. Here’s a closer look at why Red Circle Solar is the best partner for you and how our solution works. The Sanden eco heat pump is one of the most sophisticated on the market, and it is capable of producing 4500 watts of energy using just 900 watts of input. This amazing output is possible due to the use of a compressor which extracts ambient heat from the air and passes it through a CO2 heat exchanger. This compressed gas increases the pressure, which in turn increases the temperature of the gas. This heat is passed to the water that is stored within the tank. A Sanden eco heat pump is an elegant solution that helps to reduce your energy bills. It can be coupled with your existing PV solar power system to achieve further improvements, and you’ll see how the solution clearly works to improve your environmental footprint. Our team has over seven years of experience in this nascent industry. This means that we have developed strong industry ties and a solid range of products which achieve the best results for our customers. In this time, we have worked on countless successful projects and achieved fantastic results for our customers. Each project has fed into our approach which, by now, is incredibly linear and easy to implement. You can be sure that when you work with us, you’ll have a fast and effective installation. Our team is committed to the environment, and we believe that our customers shouldn’t have to break the bank to improve their environmental footprint. This is why we have developed our high-quality products as efficiently as possible, and we pass those savings along to our customers. You’ll find that our prices are very reasonable and that over time, our solution pays for itself by resulting in significant energy savings. If you would like to discuss your project and the amount that it will cost with our team, then be sure to get in touch with us today! Questions About Our Solar Hot Water Pumps? We understand that the environment is just as important to you as it is to us. We love the idea of helping others to play their part in protecting our environment, and our enthusiasm is palpable. From the beginning to the end of your project, you’ll find that our team is friendly and helpful. If you would like to launch your journey with us today, then be sure to visit our website to learn more about us. If you have any specific questions or you would like to install the best solar heat pumps Australia has to offer, then feel free to get in touch with our helpful team.